This is Abby Sue. 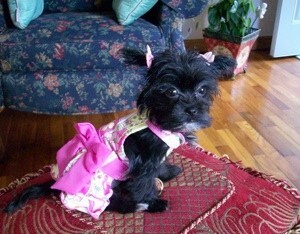 She is a 6 month old Shorky (Shih-Tzu/Yorkshire-Terrier )that we got in July of 2009 from a breeder. She likes to play with her toys, go on walks and ride in a stroller when she gets tired of walking. She is smart, she was potty trained within 3 weeks of me having her. Of all the female pups I held, she was the only one to lick the side of my face. I knew she was mine. What a cutie. Love her outfit. 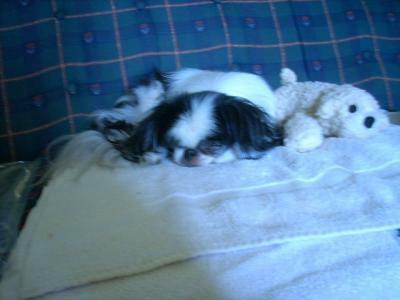 Cherish those licks.I did for almost 15 years with my Panda. Thanks for sharing. Too cute. Just want to cuddle her up!